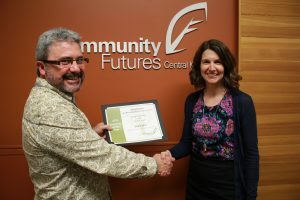 Chris Bell receiving his Community Futures Volunteer of the Year award from Andrea Wilkey, Executive Director of Community Futures Central Kootenay. Nelson, BC—Community Futures Central Kootenay (CFCK) is pleased to recognize Chris Bell for his years of volunteer work in Castlegar and the Central Kootenay. He has been involved in a variety of organizations, lending his good-natured expertise to many projects. Since 2010, Chris Bell facilitated the Castlegar-based Kootenay Business Exchange, a peer-mentoring group established in 2006. He joined the CFCK Board of Directors in 2015 and became Board Chair later that year. He is an active member of the Community Futures Loans Committee, Self-Employment Committee, and Nominating Committee. Chris is also a Judge for Junior Dragons Den and is actively involved in the Community Investment Coop project. Chris and his family moved to Castlegar over 20 years ago to open the town’s first cappuccino bar, Artistic Aromas—a business he started through the Community Futures Self-Employment Program. Today, Chris is president of Krueckl Financial Services (KFS) Inc., providing wealth-management, insurance, and financial services to families and businesses throughout the region. “I was a Community Futures client when I launched my first business in Castlegar,” said Chris Bell, CFCK Board Chair “That experience made me want to give back by volunteering for Community Futures and the community”. Other highlights of his volunteer work includes the Boards of the Castlegar Sculpture Walk, Castlegar Rotary, Castlegar Chamber of Commerce, Castlegar Golf Club, Kootenay Gallery of Art, Castlegar Foundation, Castlegar Red Cross, Castlegar Sunfest, and the Castlegar Lion’s Club.